With Larmer Tree nestled deep in the countryside on the border of Dorset and Wiltshire, many of our couples worry that there will not be enough accommodation for themselves, their friends and their family. Fear not, there are a huge number of hotels, self catering properties and bed & breakfasts that can accommodate wedding guests staying in the local area. We have listed just a few of our favourites below. Only 1.3 miles away from Larmer Tree in the little village of Tollard Royal is King John’s Inn. 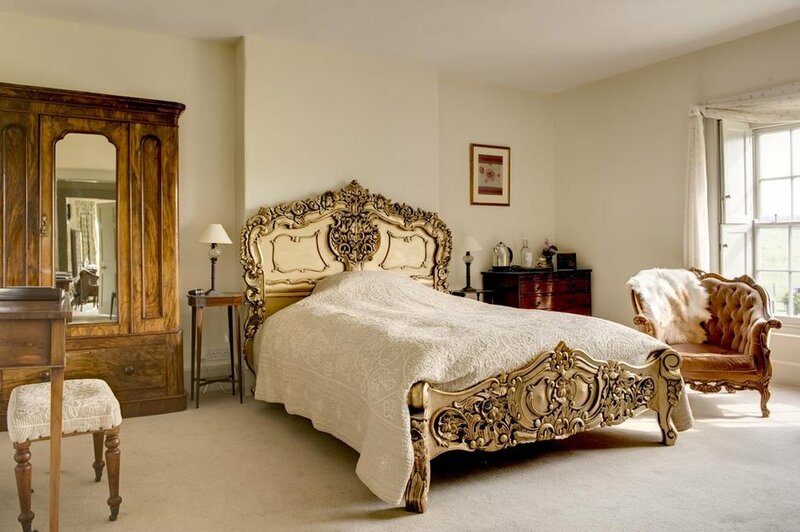 It boasts of eight country bedrooms and the beautiful ‘The King Room Suite’ which is perfect for newly weds or guests to relax in after a day full of wedding festivities and fun. All of the bedrooms are decorated with fine antique furnishings and have en-suite bathrooms with either roll top baths or rain showers with complimentary brambly toiletries for you to enjoy. You’ll sleep soundly after dancing the night away in their king sized beds with luxurious feather bedding. To top it off all of the rooms are dog friendly so your furry friends don’t get left out. The Museum Inn is a 5 minute drive from Larmer tree, in the lovely village of Farnham in Dorset. It has eight perfectly appointed en suite bedrooms. Rustic country style with a modern twist epitomises their rooms each of which includes sumptuous bedding, a flat screen TV, handmade Bramley toiletries and tea-and-coffee-making facilities. You’ll be well fed with a full continental or cooked breakfast included with every stay. If you are looking for a self catering option in Farnham, The museum Inn also has Moles Cottage which sleeps 16 people. For their best rates and availability contact them on 01725 516261. Just a fifteen minute drive from Larmer Tree, The Grosvenor Arms in Shaftesbury, Dorset, has 16 boutique-style bedrooms with elegant décor. From cosy doubles to the Junior suite ( a newlywed favourite ) with a free-standing roll top bath and large private terrace, to the splendid The Cranborne suite, each room is spacious, smart and stylish. All bedrooms have large double or king beds with 100% cotton linen, en suite bathrooms, Dualit espresso machines and flatscreen TV and WiFi. For their best rates and availability contact them on 01747 850580 or email on info@grosvenorarms.co.uk. Perry Cottage Bed & Breakfast is a self-contained detached cottage in the grounds of Perry House – a Grade II listed Georgian family home. It is only a five minute drive from Larmer Tree in the Village of Tollard Royal, Wiltshire. It consists of an entrance hall with slate floor, a very large double bedroom with either a super king sized double bed or twin beds, spacious bathroom with a double ended bath and separate shower and an attractive sitting room with vaulted ceiling and oak floor. The cottage has Wi-fi connection and a flat screen television. The bedroom is fitted with linen from ‘The White Company’ and the bathroom is supplied with luxurious toiletries from the locally hand produced ‘Bramley’ range. Farnham Farmhouse is a short walk or drive from Larmer Tree gardens near the village of Farnham, Dorset. The house has flagstone floors, open fires, three quarters of an acre of garden and an outdoor heated swimming pool. All three of its bedrooms have an en-suite bathroom or shower room, flat screen televisions and beautiful views of the surrounding countryside. Sarpenela, a natural therapies centre, is onsite too, if you want to indulge in a massage or try something new. For their best rates, availability and bookings visit their website here. Just a 10 minute drive from larmer Tree. You can take the lavish Georgian Farmhouse sleeping up to 12 and the two cosy cottages each sleeping 2 in any combination. All three properties are dog friendly and family friendly. There’s so much to keep everyone happy on the Farm with an indoor swimming pool and sauna, huge walled gardens and a play Orchard to explore as well as glorious country rambles from the farm gate. The Fontmell is a 15 minute drive from Larmer Tree in Fontmell Magma Dorset. The Fontmell extends over Collier’s Brook, the village stream, which flows between the bar and the dining room. When the windows are open the babbling brook creates a serene environment in which to eat and relax. All bedrooms are en suite with walk-in showers, and selected rooms have a separate bath. The rooms have goose down duvets and pillows and crisp cotton sheets, ensuring your stay is a restful one. We allow dogs in all our rooms other than room 6. All prices include a hearty breakfast, perfect to set you up for the wedding day ahead. For availability and bookings telephone 01747 811441 or email info@thefontmell.com. Each of the nine individually designed bedrooms in the main house has an en-suite bathroom and a specific personality. If guests need a reason to visit, the unique feel and charm, along with fabulous views, provide the ideal location for a weekend away, a holiday in the heart of Dorset, a wedding or shooting party. Dogs are also welcome at Kasteel Collection and a number of the rooms are pet friendly. So friendly in fact, that luxury dog beds and treats can be arranged prior to your stay. Kasteel Collection provides the perfect environment for a country retreat but also offers an endless array of activities such as cycling, fishing, horse riding, shooting and sailing. 10 Castle Street is a members club however non-members who would like to stay can do so by becoming passing members. Older PostAnd the Winner is....Larmer Tree!! !